Theaim of this study was to assess the role of magnetic resonance cholangiopancreatography (MRCP) in the diagnosis of malignant biliary obstruction. MRCP is an established technique for the evaluation of intrahepatic and extrahepatic bile ducts in patients with known or suspected hepatobiliary disease. It is considered a reliable, noninvasive alternative to diagnostic endoscopic retrograde cholangiopancreatography. This study was conducted on 43 patients (28 male and 15 female) with malignant obstructive jaundice. Their ages ranged between 30 and 85 years with a mean age of 56.86 years. MRCP protocols applied for imaging of the hepatobiliary system were as follows: T2-weighted fast spin echo sequence on the axial and coronal planes; three-dimensional, fat suppressed, heavily T2-weighted fast spin echo sequence with multislab acquisition mode; two-dimensional thick single slab projectional images; and three-dimensional reconstruction algorithms. Among the patients, jaundice and biliary colic were the most common clinical complaints. MRCP detected different pathologic entities, including cholangiocarcinoma, hepatocellular carcinoma, pancreatic carcinoma, distal common bile duct stricture, periampullary carcinoma, gallbladder carcinoma, lymphoma, metastasis, and suprarenal carcinoma. The MRCP diagnosis was compared with the final diagnosis reached using histopathologic data, tumor marker, and follow-up imaging. MRCP provides a safe, noninvasive, accurate diagnostic tool in the detection of the cause, level of biliary obstruction, and lymph node spread. Jaundice refers to the yellowish coloration of the skin and sclera caused by the accumulation of bilirubin in the skin and mucous membranes . Malignant obstructive jaundice is a common disease observed in clinical practice and is caused by tumors arising from the pancreas, biliary tree, and secondary metastases in the liver or in porta hepatis lymph nodes (LNs) . Over the past decades, major advancements in the diagnosis of malignant obstructive jaundice have been made. The site of obstruction in biliary tree can be identified accurately using noninvasive methods such as ultrasound (US), computed tomography (CT), percutaneous transhepatic cholangiography (PTC), and endoscopic retrograde cholangiopancreatography (ERCP) . Accurate methods for detecting biliary diseases are important to both surgeons and endoscopists. At present, endoscopic ultrasonography and CT, although noninvasive diagnostic tools, are not always sufficiently sensitive . ERCP still is the gold standard for exploration of the biliopancreatic region. Nevertheless, ERCP is associated with significant complication rates. Therefore, there is a clear need for a less invasive, safe, and highly sensitive diagnostic procedure for patients with suspected bile duct or pancreatic duct diseases . The development of fast imaging sequences and the improvements in the quality of abdominal images have generated a new interest in magnetic resonance evaluation of biliopancreatic diseases . Using heavily T2-weighted sequences, the signal of static or slow-moving fluid-filled structures such as the bile and pancreatic ducts is greatly increased, resulting in increased duct-to-background contrast. Hence, signals from the fluid from the biliary system and pancreatic duct are hyperintense, whereas signals from the background tissue are hypointense, enabling excellent depiction of the biliary and pancreatic system . The purpose of our study was to assess the role of magnetic resonance cholangiopancreatography (MRCP) in malignant obstructive jaundice. This study was performed between October 2014 and March 2016. Approval of the Ethical Committee, Menoufia University, was obtained. This study is a retrospective one and all patients' data are anonymous. It included 43 patients, 28 male and 15 female, whose ages ranged between 30 and 85 years (mean age: 56.86 years). They were referred to the MRI Unit, Radiology Department, National Liver Institute, Menoufia University, for MRCP examination of the biliary tract. The patients presented with one or more of the following signs and symptoms: jaundice, biliary colic with or without fever, and loss of weight. MRCP, complementary US, and triphasic CT were performed for all cases. PTC was performed for five cases. Biopsy was performed for 25 cases. Laboratory investigations included the evaluation of total and direct bilirubin, serum liver enzymes, and tumor markers for all cases. The final diagnosis was reached using histopathologic data, tumor marker, and follow-up imaging. Patients were instructed to fast for at least 6 h before MRCP examination to promote gallbladder (GB) filling, gastric emptying, and reduce unwanted fluid signals from the intestine. Full history and consent were taken from the patients and they were asked about a history of cardiac pacemakers, ferromagnetic aneurysmal clips, metallic objects in the orbit, and any ferromagnetic materials in a critical location that degrade the image and are potentially hazardous to the patients. No premedications or contrast medium were administrated. Only sedatives (midazolam at a dose of 0.3 mg/kg/dose) were required for two adult patients with claustrophobia. The MRI machine used was a 1.5-T MRI Scanner (GE Healthcare, USA). A circular surface (synergy body) coil was used. MRCP examination was performed using breath-hold 2D single-slice fast spin echo and nonbreath-hold multislice acquisition followed by 3D maximum intensity projection (MIP) reconstruction with complementary axial or coronal T2-weighted MRIs. Patient position: spine; orientation: coronal; slice number: 1; slice thickness: 60–80 mm; TR: 8000 ms; TE: 900 ms; scan time: 6–8 s; matrix size: 256 × 256; and NEX: 1. The angle of the coronal image could be changed several times to obtain satisfactory results. Patient position: spine; orientation: coronal; slice number: 20; slice thickness: 0.8 mm; TR: 18 000 ms; TE: 650 ms; scan time: 316 s; matrix size: 256 × 256; and NEX: 2. MRCP multislice technique was followed by MIP reconstruction to obtain 3D MRCP images with variable rotation angle. Patient position: spine; orientation: transverse; slice number: 25; slice thickness: 7–10 mm; TR: 3000 ms; TE: 100–150 ms; scan time: 1.5–4 s; matrix size: 256 × 256; and NEX: 2. Axial T2-weighted MRIs of the upper abdomen were obtained first before MRCP as they served as a guide to determine the correct obliquity of the coronal oblique sections of MRCP images. The angle of MRCP examination was chosen from the section at which the biliary lesion appeared. Patient position: spine; orientation: coronal (transverse); slice number: 25; slice thickness: 5–10 mm; TR: 3.5–3.9 ms; TE: 1.7–1.9 ms; scan time: 30 s; matrix size: 256 × 256; and NEX: 6. Image analysis was performed on Digital Imaging and Communications in Medicine data and hard copies were obtained by three experienced abdominal radiologists. All MRCP images were reviewed by two consultants with more than 20 years' experience in radiodiagnosis procedures and a specialist with more than 10 years' experience in radiodiagnosis procedures. Conventional MRI and MRCP images were reviewed and analyzed at different imaging sequences, including the coronal single-shot thick slab MRCP and the reformatted MIP images of the multisection thin-slice MRCP. The images were reviewed at work stations, each sequence alone followed by combined evaluation. Blind review was performed first, and then the provisional MRCP diagnosis was compared with the final diagnosis (the gold standard of diagnosis) based on patient's management either by means of further investigations, pathologic correlation, or using ERCP data. Assessment comprised analysis of MRCP as regards possible cause of biliary obstruction, level of obstruction, and LN spread. The results were collected, tabulated, and statistically analyzed with an IBM compatible personal computer with SPSS statistical package version 20 (SPSS Inc., Chicago, Illinois, USA). Descriptive statistics were used – for example, number and percent for qualitative data, and mean and SD for quantitative data (for age only). The present study included 43 patients, 28 male and 15 female, whose ages ranged between 30 and 85 years (mean age: 56.86 years). The most affected age group was between 50 and 59 years. The least affected age group was between 80 and 89 years. Analysis of the data obtained by means of clinical examination revealed a wide range of clinical signs and symptoms occurring separately or in conjunction. Jaundice was the most common presenting complaint (65.1%). The MRCP findings in the biliary tree of the 43 patients showed findings of different pathologic entities. 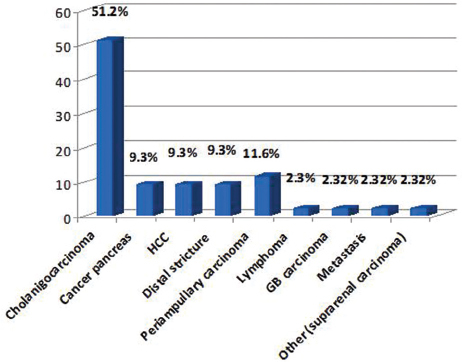 Cholangiocarcinoma constituted the largest number of patients, 22 out of 43 (51.2%) cases. GB carcinoma, lymphoma, metastasis, and suprarenal carcinomas constituted the least number of patients (2.32% for each) [Figure 1]. Figure 1: Possible cause of biliary obstruction detected using magnetic resonance cholangiopancreatography among studied cases. GB, gallbladder; HCC, hepatocellular carcinoma. Final diagnosis was reached by correlating with histopathological data, tumor markers, and follow-up imaging. There was perfect symmetry between MRCP results for the diagnosis of malignant biliary obstruction in relation with the results of various confirmatory modalities in the diagnosis of cholangiocarcinoma, cancer of the pancreas, distal stricture, periampullary carcinoma, lymphoma, suprarenal neoplasm, and GB carcinoma. However, in case of hepatocellular carcinoma (HCC), there was 75% symmetry and 25% was misdiagnosed as cholangiocarcinoma [Table 1]. Cholangiocarcinoma was the most common cause of malignant biliary obstruction (53.48%). Cholangiocarcinomas were classified anatomically and morphologically. The most common anatomic type was the intrahepatic type, whereas morphologically the mass-forming type [Figure 2] was more frequent compared with the periductal infiltrating type [Figure 3]. Figure 2: A 66-year-old male patient presented with progressive jaundice and abdominal pain. (a) Axial T2-weighted image; (b) coronal T2-weighted image; (c) 3D magnetic resonance cholangiopancreatography with maximum intensity projection: large central lobulated hepatic mass with high T2 and low T1 signal [(b) and (c), red arrows) compressing both the right and left hepatic ducts with moderate dilated bilobar radicles [(a) and (b), yellow arrows]. Diagnosis: cholangiocarcinoma. Figure 3: Classification of cholangiocarcinoma. The study group consisted of 43 patients (28 male and 15 female). Their ages ranged between 30 and 85 years, with a mean age of 56.86 years. Biochemical criteria of the patients with malignant obstructive jaundice reveal elevation of both total and direct bilirubin in 95.34% and elevated alanine transaminase in 46.5%, elevated aspartate transaminase in 39.53%, elevated alkaline phosphatase in 60.4%, and elevated γ-glutamyl transferase in 39.5%. Madhok and Rastogi  revealed that serum bilirubin level and alkaline phosphatase were elevated in all patients with malignant obstructive jaundice. Elevated tumor marker was noted in malignant biliary obstruction. In our study, elevated α-fetoprotein was noted in case of HCC patients (6.79%). Elevated CA 19-9 was observed in case of cholangiocarcinoma (32.55% from all patients and 63.63% of cholangiocarcinoma patients). Okuda et al. noticed that α-fetoprotein-positive patients presented HCC features, which were very different from those of classical intrahepatic cholangiocarcinoma (IH–CCA) whose patients were seropositive to CA 19-9. In our study, MRCP was accurate in depicting the level of obstruction in all 43 cases. Accurate detection of the level of obstruction in all cases of periampullary carcinoma (100% sensitivity and accuracy) was observed; this is nearly similar to that reported in the study by Singh et al. , who reported 100% sensitive, specificity, and diagnostic accuracy in detecting periampullary carcinoma [Figure 4]. In our study the incidence of extrahepatic biliary obstruction was the more common type of biliary obstruction. This was closely related to the study by Zhong et al. , which had shown the same results. In our study, the incidence of intrahepatic cholangiocarcinoma (77.27%) was more common compared with extrahepatic cholangiocarcinoma, whereas Hennedige et al. stated that extrahepatic cholangiocarcinoma (90%) is more common compared with intrahepatic cholangiocarcinoma (10%). The study by Meong et al. showed that the sensitivity, specificity, and accuracy of MRCP can be increased by 17–20% when T1-weighted and T2-weighted image are combined with MRCP images for the differentiation of benign from malignant causes of biliary dilatation [Figure 5]. In our study, conventional MRIs played an important role, helping in the diagnosis of malignant biliary obstruction in detecting the site of malignant biliary lesion with its intrahepatic or extrahepatic biliary ductal extension and the presence of associated metastasis, lymphadenopathy, organomegally, fluid collections, and its location. Figure 5: A 62-year-old female patient presented with abdominal pain and progressive jaundice. (a) Axial T2-weighted image; (b) coronal T2-weighted image; (c and d) 3D magnetic resonance cholangiopancreatography with maximum intensity projection: soft tissue mass is seen occupying the gallbladder fossa measuring about 76 cm [(a) and (b), red arrows]. The mass infiltrate surrounding liver parenchyma and cystic duct, common hepatic duct, and proximal common bile duct with consequent moderate intrahepatic bile ducts [(c) and (d), red arrow]. Diagnosis: right suprarenal carcinoma. Different intensities were detected at T2-weighted image. 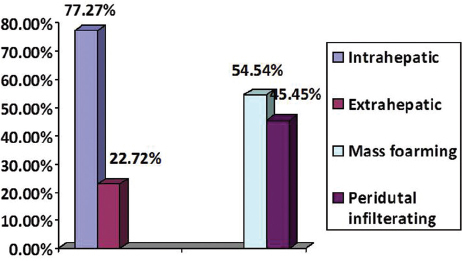 Hyperintensity was the most common among all lesions (51.16%). HCC and cholangiocarcinoma are predominantly hyperintense. Vanderveen and Hussain  stated that cholangiocarcinoma appear hypointense on T1-weighted and hyperintense on T2-weighted imaging relative to liver parenchyma. Regional LNs should be assessed in a case of malignant biliary obstruction [Figure 6]. Regional LN was affected in 37.20% of cases. LN was affected in 40.9% in case of cholangiocarcinoma, which was nearly similar to a study by Madhok and Rastogi  in which four of eight (50%) cases revealed regional LN affection. Figure 6: Axial T2-weighted images: segment IV hepatic mass with high-signal at T2 [(a), red arrow] compressing the left duct with moderate left lobe biliary radicles. Enlarged porta hepatis lymph node with high-signal at T2 metastatic [(b), red arrow]. Finally, from this study we found that MRCP has several merits as a developing technique in the evaluation of patients with malignant biliary obstruction as follows: MRCP is a complete noninvasive technique that provides projectional images similar to that of ERCP without the administration of contrast agents and the use of radiation and medications, and is less operator dependent. Moreover, no complications were encountered in adequately screened patients. MRCP provides global presentation of the pancreaticobiliary ductal system, both proximal and distal to the site of the biliary obstruction. MRCP can depict the nature of the obstructing lesion at the site of the obstruction. MRCP can be used in the cases of technical limitations of ERCP and as a part of complete MR examination and extends the diagnostic information from the biliopancreatic tract morphology to the surrounding structures. Despite the several advantages of MRCP, there are also some limitations encountered in our study: its relatively high cost at present, which is a major problem as most of the patients are of poor socioeconomic status; the fact that the procedure can cause claustrophobia; its inability to offer therapeutic intervention as compared with ERCP and to a lesser extent compared with PTC; the obtained image quality can be degraded by many factors, including marked obesity, massive ascites, inability to maintain breath holding during the breath-hold technique, as most of the patients were not cooperative. From this study, we concluded that MRCP is highly accurate in detecting the presence and defining the level of malignant biliary obstruction. It is a noninvasive, safe, and effective method. Thus, we recommend that MRCP should be performed as the next step after depicting biliary obstruction using US. MRCP will provide the basis for not only subsequent diagnostic protocol but also the suitable therapeutic procedure, whether surgical or interventional. El-Gendy FM, Hassane FM, Khattab AA, El-Lahony DM, Ashour NM. Predictive ability of first-day serum bilirubin and haptoglobin for subsequent significant hyperbilirubinemia in healthy-term and near-term newborn. Menoufia Med J 2014; 26:127–131. Ma AH. Analysis of 17 cases of cholangitis by ERCP. Chinese J Endosc 2008; 14:669–670. Schmidt S, Chevallier P, Novellas S, Gelsi E, Vanbiervliet G, Tran A, et al. Choledocholithiasis: repetitive thick-slab single-shot projection magnetic resonance cholangiopancreaticography versus endoscopic ultrasonography. Eur Radiol 2007; 17:241–250. Liu L, Wang W, Sun Q. Analysis of 58 cases of endoscopic biliary stenting for malignant obstructive jaundice. Wuhan Univ Med Sci 2008; 29:632–634. Ito K, Fujita N, Noda Y, Kobayashi G, Obana T, Horaguchi J, et al. Pancreatic guidewire placement for achieving selective biliary cannulation during endoscopic retrograde cholangiopancreatography. World J Gastroenterol 2008; 14:5595–5600. Shen Y, Liu H, Zhang JL. The X-ray contrast diagnosis of malignant obstruction of extrahepatic bile duct. Chin J Prac Med 2009; 4:143–144. Madhok R, Rastogi S. Role of 3.0 tesla magnetic resonance cholangiopancreatography in obstructive jaundice with cyto/histopathological or surgical correlation. Int J Sci Stud 2015; 3:1–7. Okuda H, Shiratori K, Yamamoto M, Takasaki K, Nakano M. Clinicopathologic features of patients with intrahepatic cholangiocarcinoma who are seropositive for alpha-fetoprotein-L3 and those with combined hepatocellular and cholangiocarcinoma. J Gastroenterol Hepatol 2006; 21:869–873. Singh A, Mann HS, Thukral CL, Singh NR. Diagnostic accuracy of MRCP as compared to ultrasound/CT in patients with obstructive Jaundice. J Clin Diagn Res 2014; 8:103–107. Zhong L, Yao Q-Y, Li Lei, Xu J-R. Imaging diagnosis of pancreatobiliary diseases: a control study, World J Gastroenterol 2003; 9:2824–2827. Hennedige TP, Neo WT, Venkatesh SK. Imaging of malignancies of the biliary tract – an update. Cancer Imaging 2014; 14:14. Meong JK, Donald GM, Katstuuyoshi I. Biliary dilatation: differentiation of benign from malignant causes-value of adding conventional MR imaging to MR cholangiopancreaticography. Radiology 2000; 214:173–181. Vanderveen KA, Hussain HK. Magnetic resonance imaging of cholangiocarcinoma, Cancer Imaging 2004; 4:104–115.